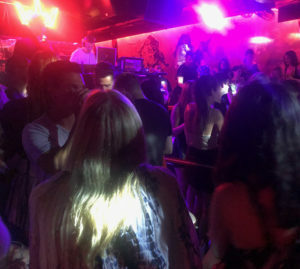 The past July 4th weekend was quieter than usual in the Hamptons due to its occurrence on a Wednesday, however there were still some major happenings. After taking the 4:06 PM bullet train to Southampton, which was packed with thousands of people, I arrived at the station at 6:06 PM on Friday-two hours later. I proceeded to my hosts, the Shafiroffs, newly built magnificent house on Wyandach Lane-this is a premier location in the Hamptons as it is one block away from the beach and on the lake. The house was replete with a massive indoor pool, a roof deck and an elevator that allowed me to carry my suitcase to the top floor. 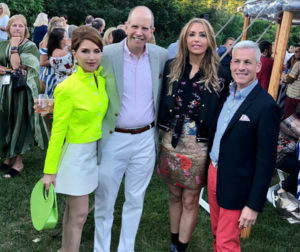 On Saturday July 7th, I joined Jean Shafiroff at the Southampton Historical Museum’s annual “Halsey House Gala” where cocktails and light hors d’oeuvres were served. We then ate dinner at Yama Q, a delightful sushi restaurant in Bridgehampton, for which reservations are not taken. Feeling restless after a major meal, I headed to club “AM Southampton” at 125 Tuckahoe Lane which was hosting “Celebrity Saturday” and was packed with dozens of people anxiously trying to attain entry. Owner Zach Erdem had to stand outside to monitor the throngs and calm anxious attendees. Erdem is ubiquitous in Southampton as he owns restaurant 75 Main, AM Southampton and Hotel ZE. Earlier in the evening the reality show “Summer House” was filming at 75 Main and Erdem could be seen in fancy attire-perhaps signaling his television debut. 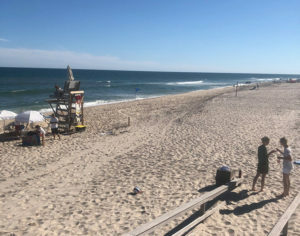 Hamptons residents are furious that a trashy TV show is being filmed in its backyard and even the cops were recruited to help with the show-they said they were being paid overtime. On Sunday, Jean and I strolled through Southampton town and visited stores Intermix, Alice and Olivia and Michael Kors. After building up an appetite we headed to restaurant Sant Ambroeus which had a delicious beet salad which we ate in the outdoor garden. Traffic was surprisingly light as we made our way to the house of Loida Lewis in Easthampton, wife of deceased entrepreneur Reginald Lewis, who was holding a fundraiser for Perry Gershon and Carolyn Maloney at her massive estate. 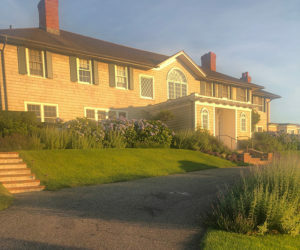 Alec Baldwin and his wife Hilaria, who just gave birth, held court at the magnificent six acre beach house on Lily Pond Lane. Alec refused to do his famous Trump impression explaining he felt it was time to move on as he hurried home with his wife to put their children to sleep. Loida Lewis, is a delightful dynamo who was CEO of Beatrice International after her husband’s demise in 1993. She is actively involved in politics and holds numerous fundraisers at her homes in the Hamptons and New York. Dinner was served on her deck which had 360 degree views of the entire Easthampton beach and guests were passionately discussing the upcoming elections. 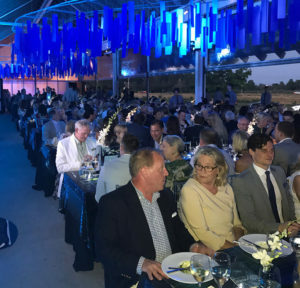 Another spectacular event is this year’s “25th Annual Watermill Center Benefit” which takes place at The Water Mill Center on 39 Water Mill Town Road on Saturday July 28th from 6PM to 12AM. The event will feature art installations from International program participants from over 25 countries which will adorn the eight-and-a-half acre property. People fly in from all over the world to experience this awesome event with many calling it the “best” of the summer. 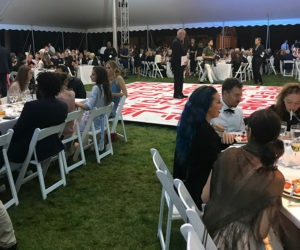 Last year Alexander Soros brought three tables of top models and bid on most of the artwork to the chagrin of other attendees. Tickets start at $500 for the cocktail hour and $1,500 for the dinner and can be purchased by contacting Erin Wainwright at 212-253-7484 or accessing the website at [email protected]. Another evening you won’t want to miss is this year’s “Southampton Animal Shelter Dinner Dance” which takes place at a magnificent mansion on Gin Lane on Saturday July 21st from 6:30-11PM. 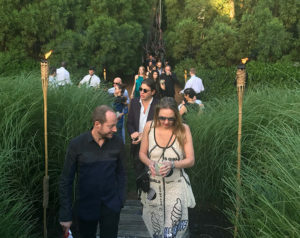 For the reasonable price of $500 you can experience a magical Hamptons evening at a multimillion dollar estate. For more information call Walter at 631-488-8000 or send an email to Sasfinc.org. 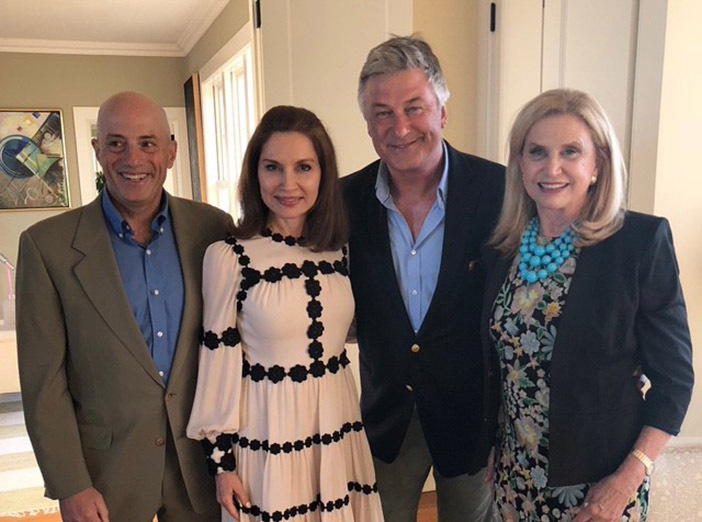 Philanthropists Maria and Ken Fishel will host the 14th Annual “Hamptons Happening” at their sprawling Bridgehampton estate this summer to benefit The Samuel Waxman Cancer Research Foundation on Saturday July 14th from 6:00 to 10PM. The event features over 30 of the top chefs and restaurants in New York City and tickets are $1000 for VIP’s $425 for adults or $200 for millennials and can be bought by calling 212-867-4502. For all things Jewish there is no better place to stop than the “Hamptons Synagogue” in Westhampton Beach which will hold an Author’s discussion given by renowned author Ruby Namdar this Thursday July 12th. On July 14th a sermon by Ari Berman, President of Yeshiva University will be given on the exciting topic of “Leadership in the Jewish World” concluding with a 6 PM lecture by Rabbi Ethan Tucker-President of Yeshivat Hadar. On Saturday night at 8 PM a community forum will be held featuring Ari Berman and Eric Metaxas of the “Eric Metaxas Show.” On Sunday July 15th Eli Beer, head of United Hatzalah, will hold a breakfast where he will thank Westhamptonites for donating 35 ambucycles the most of any synagogue in the world.